28MHz has been in good shape recently, so I wanted to go out portable and try my end fed half wave parallel tuned circuit coupler as I have not tried it on 10m before. The band was in good shape (unlike the weather) and it seemed to work well. 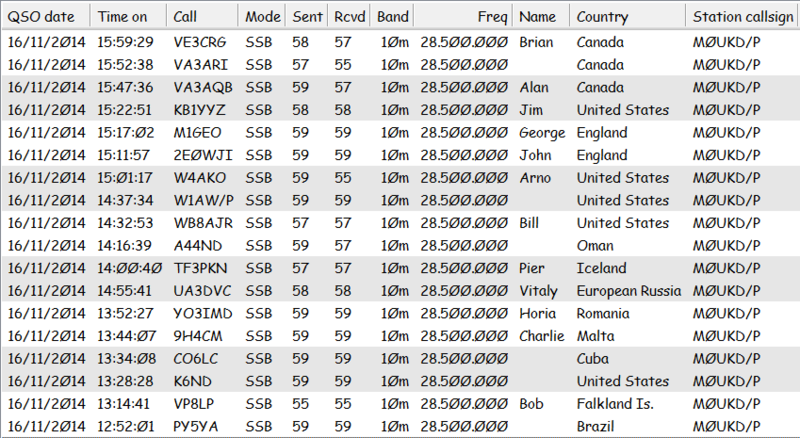 I managed to work some good DX whilst I was there, the log can be seen below. I also took a little video of me working VA3AQB – Alan in Canada. The coupler seemed to work well on 10m and with a bit more bandwidth than other bands, perhaps because very little capacitance was needed. I’m enjoying making the most of the higher bands whilst they are open! John. 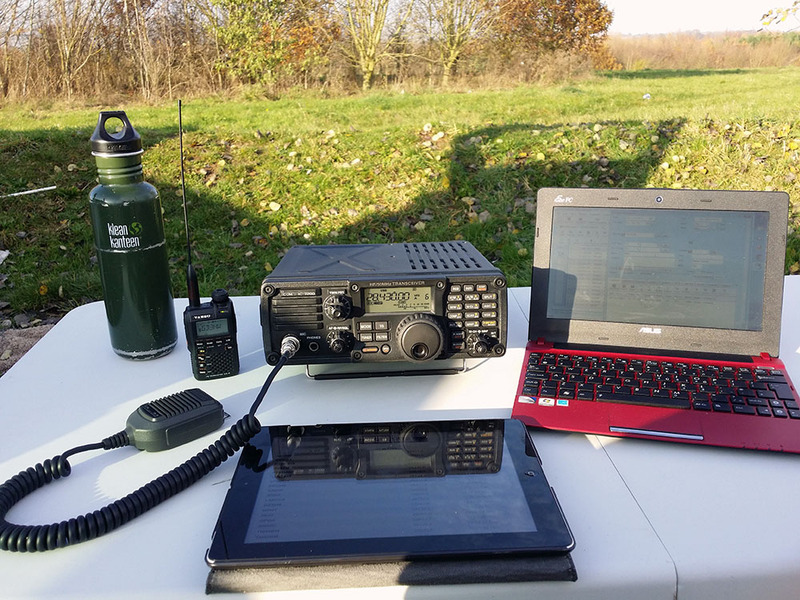 We went out for some portable operating today, as the weather was nice. Our club has a topband net each Saturday at 2pm and I wanted to try an antenna for the upcoming 160m AFS Club Calls contest. Using Dave M0TAZ’s 18m spiderbeam fibreglass pole as a loaded quarter wave, with an inductor (340μH) towards the top of the antenna. It makes it all a bit critical having the inductor so high, but the big advantage is that the bottom 15.5 metres has a lot of current in it, leaving only the 2.5 metres above it at a high impedance, making a better radiator. Ground was provided by a chicken wire fence, which I have used many times before with good results. Below is a short video showing the antenna first on 24MHz where Dave is working Bahrain where the vertical was set up close to a ⅝ wave, then afterwards, it’s fully extended with the loading coil 15.5 metres up, making it a loaded ¼ wave for 160m. 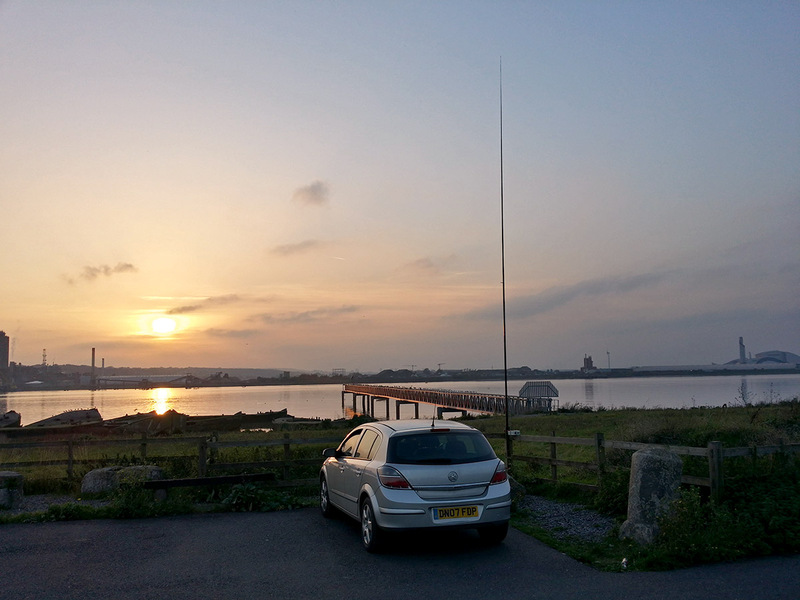 The antenna was resonant at 1830kHz, a bit low, so the ATU was used. I calculated for 1900kHz, so I guess 70kHz off isn’t bad! It would be easy enough to fine tune it. Lovely day for it, a bit breezy towards the end though! 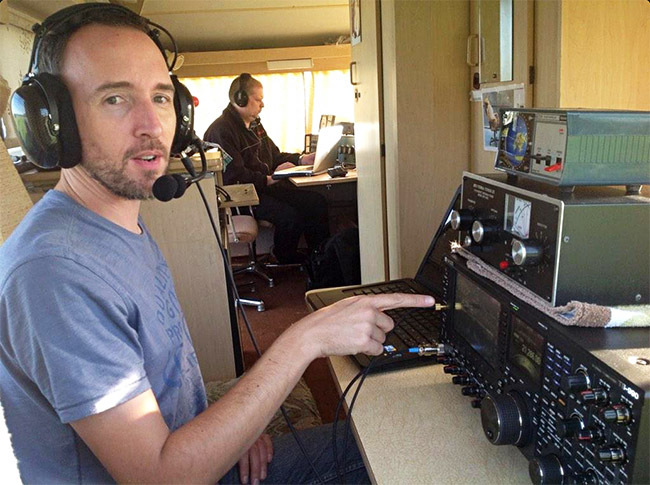 I was operating portable on 12m (21MHz) today. It’s a band which I have hardly ever used, so I cut a half wave length of wire and used my End Fed Half Wave Coupler to match it at the base of the fibreglass pole. Conditions seemed good and I was able to work Chicago, Massachusetts, California, New York and Texas in a short time. Below is a short video and photo of the setup. Operating on 12m beside the river Thames. 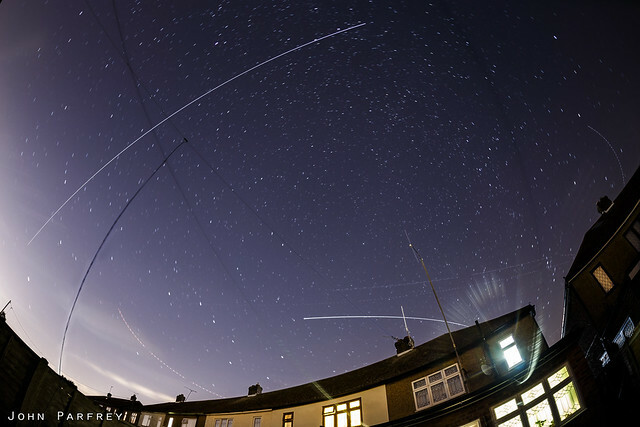 It was a clear evening last night, and the international space station was due to pass almost directly overhead (86º peak). Below is an image of the pass. My antennas are visible (Doublet, 70MHz dipole and X-50). I’m still yet to receive any signals from all those other solar systems! I went out for a little bit of /P operating this afternoon for just over an hour as the weather was OK. Had a nice chat on 40m with some UK stations using the end fed half wave set up as a kind of sloper. The end was up 8m on a fibreglass pole just resting against a tree, and the feed end came down to a low tree branch and then into the coupler. It seemed to perform really well on TX and RX. Below is a little clip recorded by Dave M0TAZ. Running 100w from the Icom IC-7200.